Would you like a chance to win a new Bass Boat? Enter the Bassmaster Fish with Randy Howell Sweepstakes now through July 31, 2018 at bassmaster.com/fishwithRandy for your chance to win a trip to a to-be-determined U.S. location to fish with Randy Howell. Trip Includes: Round-trip, coach-class airfare, hotel accommodations, $500 spending money apart from this you could also win Bass Boat and many other exciting prizes. How To Enter: Visit this link: http://www.bassmaster.com/fishwithRandy during the sweepstakes period and follow the online instructions to register by entering all information requested on the registration form and once you filled out the entry form now Click on the submit button to complete the registration form. 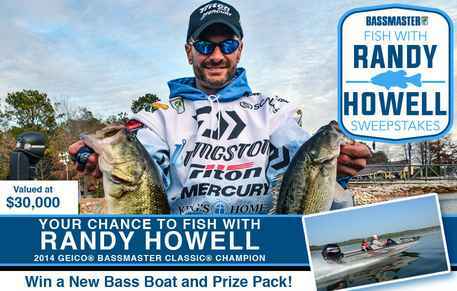 When To Enter: The Fish with Randy Howell Sweepstakes entry begins at 12:00:01 AM Eastern Time (“ET”) on Sunday, April 1, 2018 and ends at 11:59:59 PM ET on Tuesday, July 31, 2018. Who’s Sponsor: The sweepstakes is sponsored by B.A.S.S., LLC, 3500 Blue Lake Drive, Suite 330, Birmingham, AL 35243.